Full details exposed including names and phone Nos. (Lanka-e-News -11.Sep.2016, 11.55PM) The dissenting judgment of High court judge Shiran Gunaratne alias ‘tinkering baas’ when the majority verdict was delivered by the three judges panel in the murder of four individuals including Bharatha Lakshman, had been written by a judge who had nothing to do with the case during the final phase of the case proceedings ,and not by Shiran based on information reaching Lanka e news courts inside information division. Shiran in his dissenting judgment declared all the accused were not guilty and exonerated them of all charges , thereby saying they can be acquitted. The decision on the 8th of Shiran alias Tinkering Baas had been written by High court judge Mohan Seneviratne, a most bootlicking lackey and lickspittle of MaRa, who was assisted by Dammith Thotawatte , another pro MaRa scoundrel. Interestingly this villainous troika members are notorious Sarath N Silva’s sidekicks .They secured posts of judges because of him. All three of them got appointments as high court judges straight from the Attorney General’s department and did not rise from the posts of Magistrates. This conspiracy was hatched at Gotabaya’s residence with the participation of Sarath Silva and another infamous ex chief Justice Mohan Peiris who had given counsel. The judgment written by Mohan Seneviratne assisted by Thotawatte counseled by Sarath N Silva and Mohan Peiris was delivered by Shihan on the 8 th. The Sinhala language in the judgment too is not Shiran’s .Though Shihan can manage with English , he cannot write Sinhala poetically at all – the poetic language used in the judgment. Moreover , Duminda Silva came to court most confidently on the 8 th because Shiran had shown the ‘tinkering baas judgment’ to Gotabaya and Sarath Silva on the previous day – 7 th September . Lanka news already revealed in its report Duminda conducted himself calmly and confidently in court. These rascals did not know that the other two exalted judges of the panel were going to deliver a different verdict. It is a well and widely known fact that Mohan Senevirathne despite being a judge behaves like a villain who resists every case in court of the FCID and CID. Just because his father was a retired SSP , he tries to show off that he is a pundit and he knows everything about Police activities. 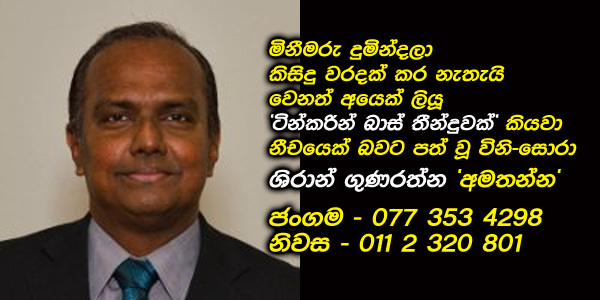 Earlier on Lanka e news revealed Dammith Thotawatte is an illegal pleasure providing judge , and is the illicit lover of another notorious sexually frustrated Ms. Kaveendra Nanayakkara the chief magistrate , Gampaha. ( She was the judge who on the first day itself in the Rathupaswela multiple murder case said , she cannot see any murderers in the case ) . Prior to Titawatte ‘s appointment as a high court judge by Sarath Silva , he was throughout an officer seconded for service by the AG’s department as a legal advisor for the forces. (Judge Advocate) . Hence he is mentality warped and thinks militarily. He is noted for stooping to anything any time to rescue Gotabaya. The legal luminaries , legal analysts and prominent lawyers of the legal circle have nothing worth to say in regard to the judgment of Shiran in the Bharatha Lakshman case except mock at for it is a decision that deserves a place in the Guinness book of most ignominious records…..
* Even after the Government analyst department had confirmed that the shooting was carried out by a weapon belonging to the LTTE , why wasn’t a single accused found guilty by Shiran for possession of illegal arms at least under the illegal arms Act, the legal luminaries question. * Moreover , the murder took place on the Elections day and the Elections Commissioner based on the complaints received regarding the violence of Duminda Silva and his group in the morning , has in writing ordered the IGP to take action and curb it. Despite all those being recorded as evidence in the case , why weren’t the accused not charged for unlawful assembly a least ? * The legal luminaries also question, when it has been clearly stated in the medical report Duminda was drunk , isn’ t there a punishment on account of a drunken brawl ? Lanka e news is in possession of all data and information about those including the intermediaries who put through this illicit disgraceful deal in association with tinkering baas judge Shiran. At the appropriate moment we are ready to expose all the sordid details. Therefore , if there are other judges too who are nursing hopes of putting through such deals and deliver ‘tinkering baas decisions,’ please beware – woe betide is our warning !